Over the past Thanksgiving holiday weekend, I had the chance to visit Ottawa, Ontario and Gatineau, Quebec. The weather was beautiful, I got some incredible pictures, and I went for many lengthy walks. Even the drive cooperated with our travel plans and we sailed through Toronto en route to our destination, then took a leisurely and winding trip back home. In particular, we stopped in Peterborough, Ontario and checked out the incredible engineering feat that is the Trent-Severn Waterway National Historic Site. I loved visiting with family and friends in this new city, and found it stimulating to see the sights and sounds of Parliament Hill. The view was spellbinding, and I dizzily hung onto a sturdy iron fence overlooking the Ottawa River while my fiancé pointed out the highlights in and around the area. Having lived in the city previously, he knew the main focal points and how to navigate the unfamiliar, crazy streets. I was immensely grateful for his presence and navigational skills. A View of the Ottawa River. © Maria Legault 2013. As with most of my recent trips, I learned a lot in a short amount of time of visiting this new city. First and foremost, I found out that there was once a cat sanctuary on Parliament Hill. This popular tourist destination was once home to dozens of stray cats that lived in and around the area to catch mice (CBC News, January 4th 2013). By the 1950s, this function was less necessary and the cats were no longer needed (CBC News, January 4th 2013). With time they started to move away into the homes of the volunteers that cared for them in their elaborate housing complex (CBC News, January 4th 2013). It seemed jarring amidst all the grandiose architecture of the Parliamentary buildings to see this sad, cordoned-off piece of land with its ragtag tree stumps and Caution Keep Out warning tape. 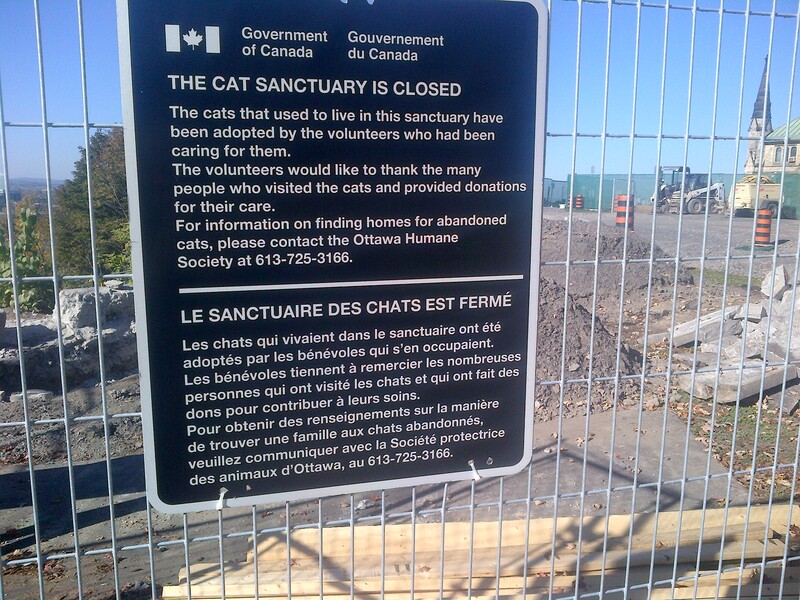 Cat Sanctuary on Parliament Hill – Closed Forever. © Maria Legault 2013. I also learned about many faucets of Canadian history through the elaborate displays in the Canadian Museum of Civilization. This beautifully-designed building houses multiple floors of interactive dioramas: I saw the jacket of Louis Riel, peered at the flask of John A. Macdonald, and stood in multiple buildings imitating life in 19th-century Canada. Life-sized mannequins shocked me at every turn, appearing so still and quiet in their constant reenactment of early Canadian lifestyles. (Though a perfect prelude to Halloween and the creepy days of late fall, I would not recommend perusing these exhibits with a weak heart and/or bladder). 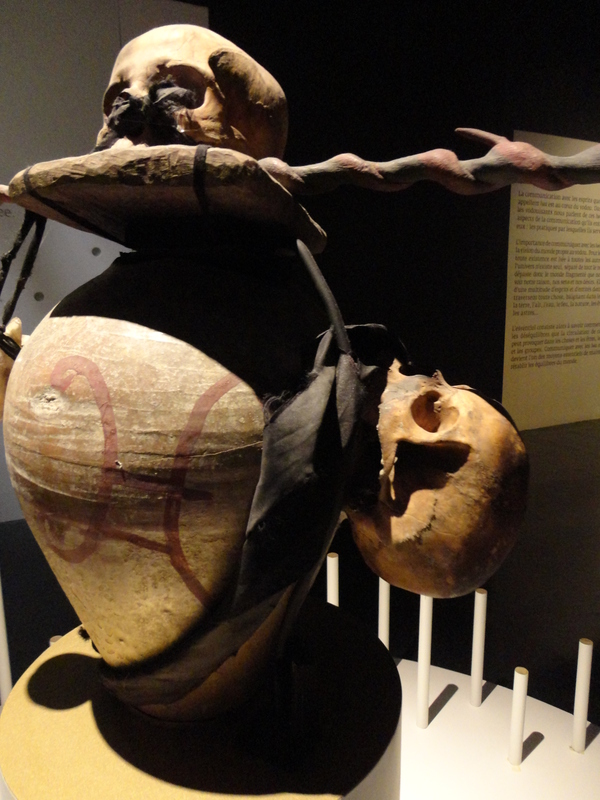 I also wandered through the incredibly spine-chilling Vodou exhibit. This exhibit had some insightful and rich things to say about Haitian Vodou culture and how people in this culture perceive death, the environment, and each other. Additionally, the exhibit made it clear that there are many popularized misconceptions of Haitian Vodou culture that require a more nuanced consideration by the public (Vodou exhibit). Interestingly, over 300 of the artifacts presented here come from the Marianne Lehmann collection – a woman whose house must be quite the sight at night! (see this article and this overview of Marianne’s collection). I hope to return to Ottawa and Gatineau in the foreseeable future to take in more of the excellent museums, urban vistas, and nature trails in and around the area. Vodou Exhibit at the Canadian Museum of Civilization. © Maria Legault 2013.